This laminated 2-sided chart was created as a guide for self-treatment and the treatment of others using Ohm frequency Tuning Forks. Ohm, or OM, is universally considered and healing tone, used in meditation, chanting, and sound healing. The Ohm frequency is an ideal introduction to Tuning Fork and Sound Therapy as it is an earth tone, grounding, centering and energizing. Ohm is also the preferred tone chosen by many seasoned Sound Healing practitioners because of these qualities. The Tuning Fork Primer demonstrates 14 useful applications for self-treatment, and for treating others. Each stylized photograph shows where the fork can be placed on the body and explains why each placement is beneficial. By following each of the listening and body placement recommendations shown, one can experience a comprehensive energetic body treatment. Other helpful illustrations show how to correctly hold and how to "activate" a tuning fork. 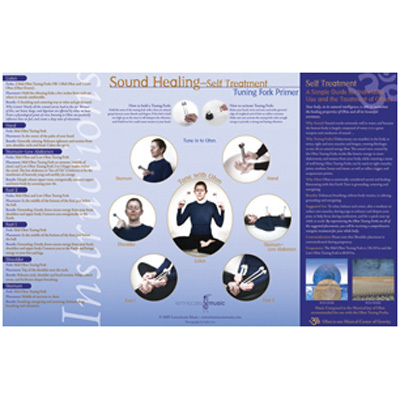 Healthcare practitioners such as Massage and Physical Therapists, Acupuncturists, and Chiropractors, among many others will find this Tuning Fork Primer an extremely useful guide for introducing the healing benefits of Sound into their practice. Because the chart demonstrates self-treatment as well, many can use the Tuning Fork Primer as and individual guide for home use. Size: 28 cm high by 43 cm wide.